"When I lived in Chicago used to go to Cicero for a treat like this, served with steamed dumplings and mashed potatoes. Use the drippings to make an incredible gravy." Heat a roasting pan over medium high heat until hot. Rub the roast with the marjoram, salt and pepper. Brown all sides of the roast in the hot roasting pan. Sprinkle caraway seeds over all and pour in enough water to come halfway up the sides of the roast. Cover and place roast in the preheated oven. Bake for 1 1/2 hours, or until an internal temperature of 145 degrees F (63 degrees C) is reached, about 30 minutes per pound. Remove from oven and let sit for 10 minutes before carving. I'm not a fan of caraway seeds so I'm not sure why I made this. Something different, I guess. DH liked it better than I did. Just too "caraway-ie" for me. I cooked my roast in the crockpot and it turned out great. The gravy was also pretty tasty. 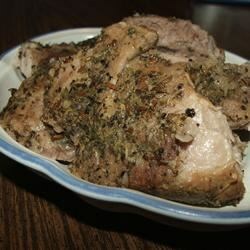 An easy to make, melt-in-your mouth, moist and delicious pork roast. Did make the gravy and it was wonderful! I grew up in the aforementioned town of Cicero and this recipe is right on the money! A taste of the sadly disappearing Bohemian restaurants found on the Cermak Road of my youth. This was excellent. We served it with Potato Dumplings (my oma's recipe); German Green Beans; applesauce; gravy; sauerkraut; and, of course, a good German beer. YUM! Thanks for sharing!